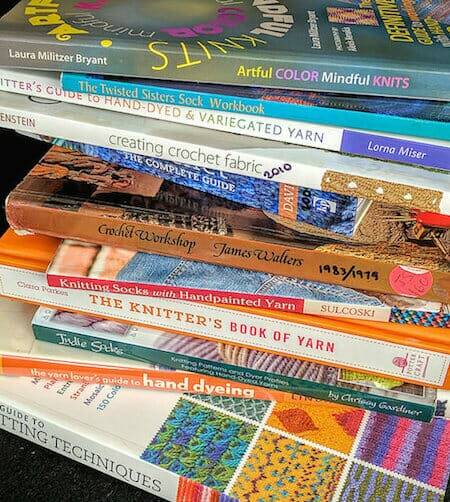 Tunisian Crochet Books are Keepers! Over the years I’ve noticed distinctive differences in the information I can depend on for Tunisian crochet research, compared to other kinds of crochet. The most intensive research I do is for classes, but I also need to for some newsletter topics and when I’m writing a pattern for an unusual design. 100% Tunisian crochet books are special and really pretty rare. Many of them are slim, booklet-like volumes. They tend to be hard to find and to get. Some go out of print quickly, are self-published, or are only in Japanese, for example. I treasure each one. That first book stack you see is my go-to stack. I’ve found a lot of useful information buried in general books about crochet.”TC” (Tunisian crochet) has long been presented in crochet books as a specialization. This means the TC topic sometimes gets its own thick chapter, and that’s a beautiful thing. Other times, the chapter or section is lean, but can make an important contribution somehow. It may have fresh and original material, or offer well designed instructions, stitch symbols, and other valuable publishing standards. From my TC perspective, it makes a big, big difference when the book’s production staff, especially the technical editors and illustrators, also understand TC (not just regular crochet). It also matters what is used as a standard, because basic Tunisian crochet publishing standards are still being forged. The book stack in the second photo shows general crochet books I own that contain TC sections I refer to often. Missing from the photo is A Treasury of Crochet Patterns by Liz Blackwell. I’ve been thinking about this post topic ever since I did one about the very different kind of book stack I devoured for the Stitch Games class topic. (That stack was mostly written about yarn by and for knitters.) 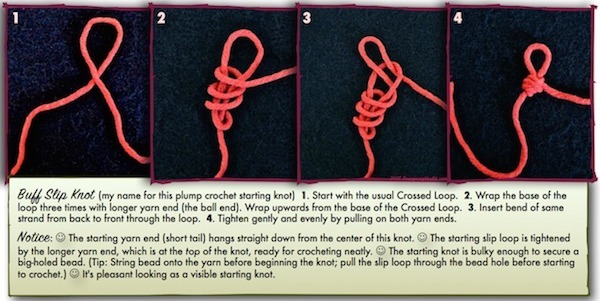 I’m also considering a post about what it has been like to unearth and use every resource I could for classes on love knots (Solomon’s knots) and star stitches over the years.